100% Electric - Book your test drive today. Available now at Park's Renault Ayr, Irvine, Coatbridge, East Kilbride, Motherwell & Dunfermline. 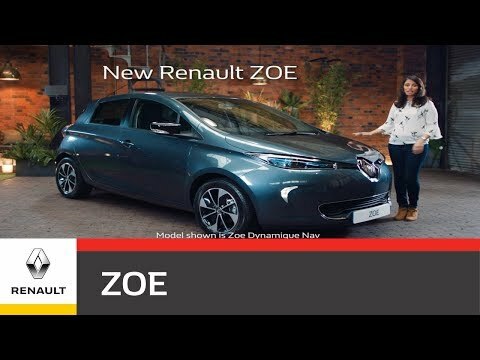 Renault is proud to present the newest electric car to the Renault family – The Zoe range. The Renault Zoe boasts a 250 mile NEDC range or 186 miles in summer from just one charge and doesn’t compromise on style, comfort or technology. The model is blissfully quiet, easy to charge and provides 100% driving pleasure all while remaining eco-friendly. The Renault Zoe is your alternative to the usual supermini vehicles. The model is unquestionably a head-turner on the road with its striking Z.E signature headlamps, electric badge and LED daytime running lights as well as a unique body shape. With the compact 5-door city car consisting of design features similar to a coupé it’s without doubt one of the most eye-catching electric cars of its time. The interior design of the Renault Zoe oozes modernity with each Zoe model exuding its own interior ambiance. The model can be finished with a blue interior colour pack available on Dynamique Nav or indulge with premium leather upholstery available on Signature Nav letting you sink into your seat and enjoy every drive. The Renault Z.E. 40 battery has proven its expertise and experience in electric vehicle innovation, offering you a greater driving range and full flexibility of 250 mile NEDC range or 186 miles in summer. The ever-increasing development and growth of electric vehicles means charging is becoming cheaper and easier. The Chameleon charger is fitted to the Renault Zoe and is compatible with a range of different sockets and sources. Zoe can add 75 miles to its range in only 30 minutes with 43kW chargers. The newest edition is packed with technology and driving aids including hill-start assist, navigation, and electronic stability control and a reversing camera makes parking child’s play. The impressive Z.E. Trip app and Multimedia services give you access to e-mail, weather and Renault Assistance and has the ability to locate the nearest charging points while travelling. All this while performing blissfully quietly - valuable if you have a fast paced lifestyle. So... are you ready to take Zoe for a spin? *Homologated range according to NEDC test cycle, for comparison purposes, 250 miles, and may not reflect real life driving results. See Driving Range page for more information. Z.E. 40 battery is available on Dynamique Nav and Signature Nav.